The OFB has received a bulk production clearance from the Army and the Defence Ministry for production of 114 first-ever indigenous artillery gun 'Dhanush', it said, adding, the clearance was received on Monday. "The gun is equipped with inertial navigation-based sighting system, auto-laying facility, on-board ballistic computation and an advanced day and night direct firing system. The self-propulsion unit allows the gun to negotiate and deploy itself in mountainous terrains with ease," the ministry said. 'Dhanush' has been mechanically upgraded to fire standard NATO 155 mm ammunition and can accommodate the bi-modular charge system (BMCS) which has resulted in increasing the range, it said. "The guns travelled extensively in towed and self-propelled mode in all terrains viz desert and high altitude with each gun clocking over 1600 km. Such an extensive exercise was carried out by the user for the first time for any gun system under the process of induction," it added. The manufacture of a 155 mm modern artillery gun was initially a challenge for the OFB. This was due to change in the vision parameters from 155x39 calibre to 155x45 calibre. The OFB received the Transfer of Technology (ToT) documents pertaining to 155x39 calibre and then converted it to 155x45 calibre successfully, the statement said. 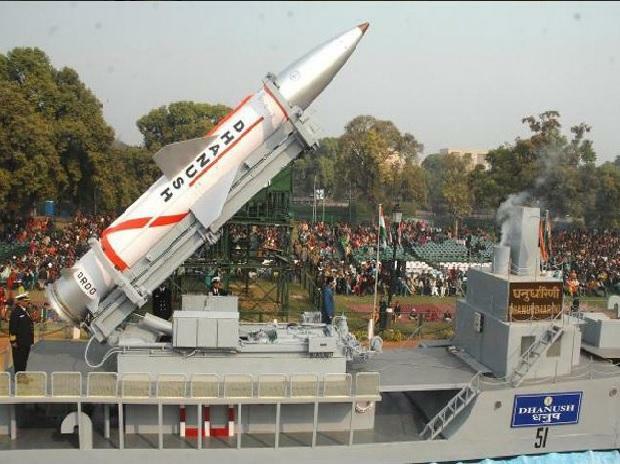 'Dhanush' is the product of joint efforts by the OFB and the Army with contributions from the DRDO, DGQA, DPSUs such as Bharat Electronics Limited, PSUs such as SAIL and several private enterprises.